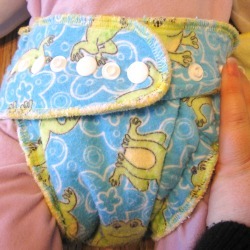 The Nifty Nappy can be folded to fit a small baby so that it is a one size fits all diaper. Then you fold down the front. Next you fan fold back up leaving a fold of fabric beneath the row of snaps. 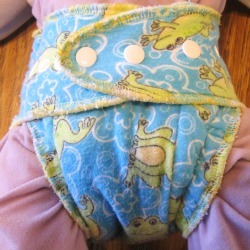 Then hold in place as you snap the diaper closed. There you go, a one size fits all diaper. The snaps hold the fold very well. I have never had any problems with it coming unfolded. 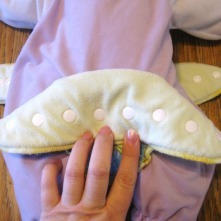 You can made the fold as large as you need and then decease it in size as the baby grows.